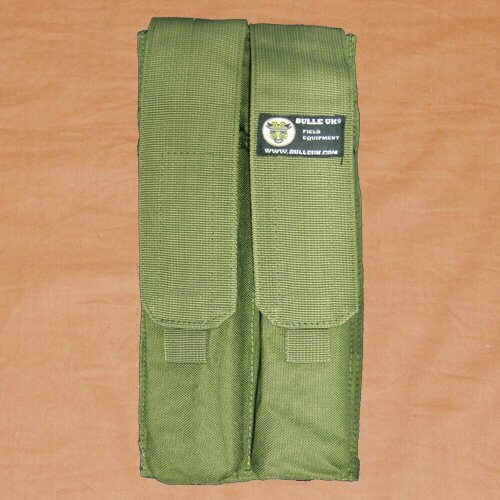 The Bulle MOLLE P90 Magazine Pouch is custom designed to fit 2x P90 or UMP magazines side by side. The pouch is designed to fit the P90 mag tightly in each pocket so as to prevent the loss of the magazine, even if the lid is retained in an open position. The pouch measures 285mm tall, 140mm wide and 30mm deep. Each pocket is internally lined with nylon lining material to prevent snagging or tugging of the plastic against the Cordura PU coating. The pouch lids cover each pocket so that opening of one lid means the other magazine is secure. These are made from Cordura webbing and are secured with velcro. 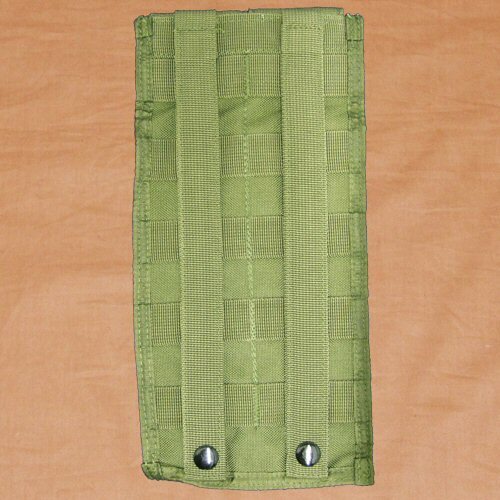 The rear of the pouch is fitted with two vertical straps for fitting on to the MOLLE base and five additional MOLLE straps for interweaving to give better stability with movement. These are finished with a press stud each. The pouch is low profile with a medium space requirement on the MOLLE base, ideal for more urban settings in which a P90 with its small size relative to user is usually used. Due to the length of the magazines contained within this pouch, the pouch may also be worn on the belt or on a leg platform without adding excessively to the body profile in these areas. Pouch is made from PU coated 1000D Cordura nylon fabric. Please note that the price is for ONE pouch only. Accessories shown are for illustration purposes only.